RAISE a glass – one of Camden Town’s favourite publicans is back in business. 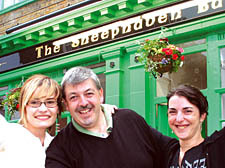 After 14 years as landlord of the Oxford Arms in Camden High Street, Pat Logue christened his new watering hole, The Sheephaven Bay in Mornington Street, with a pint or three of the black stuff on Friday. Hidden away on a quiet side street just moments from the High Street, the pub boasts a huge beer garden, conservatory space and five plasma TV screens for all sports fixtures. Mr Logue’s famous quiz night, an Oxford Arms institution, is due to start soon, alongside traditional pub grub at reasonable prices.